I've been noticing all of the trees and flowers that seem to be blooming everywhere; this time of year is one of my favorites as far as flowers go(besides the fact that I essentially rub my eyelashes off), it seems like everything that blooms now is so fresh and new. It really feels like nature's way of being optimistic. 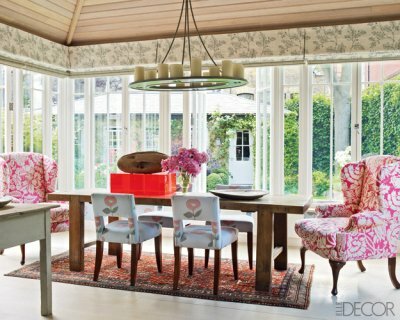 This London sunroom in the townhome of Kit and Tim Kemp is so reflective of that feeling. I adore the way the windows let the sunlight pour in and looks out over the ivy covered shed, and I love the cheeriness of the pink upholsteries (and I'm not even all that into pink!!). It's very Secret Garden-y. I might even do a more classic chandelier to make it feel more bohemian. It would just be a great place to sip a cup of tea and quietly read your book.